It's an all natural capsule that contains organic herbs and digestive enzymes - which is designed to help accelerate weight loss by blocking the absorption of sugars, carbohydrates and fats, from the foods you eat. Because less food is being absorbed, you are thus eating less calories and there will be weight loss. HOW does CHEATmeals™ work?... What are the BENEFITS? You take CHEATmeals about 20-30 minutes before a "cheat" or "bad" meal, that's high in fats and carbohydrates. Typically, this is when you go out to eat, at restaurants, around the holidays, during parties, sporting events, etc. The special herbs and fibers found in CHEATmeals, expand in your stomach and TRAP the unhealthy fat and carbohydrate calories from the meals you eat, from being absorbed in your body. What isn't absorbed, doesn't turn into calories and thus, the end result is fat loss. You get the opportunity to eat what you want occasionally, without feeling guilty. Block up to 30% of total fats (unhealthy saturated fats). Assimilate and digest the rest of the calories from you meal, to prevent gas, bloat, constipation, acid reflux and heart burn. Keep you regular, great for colon health. Reduce and normalize blood sugar and insulin levels. WHY is CHEATmeals™ BETTER than other solutions? Improve digestion and reduce stomach problems. There are products on the market that do ONE of the above, but not all 3. Thus, CHEATmeals is "3 products in 1". It contains no stimulants, good for colon and heart healthy. It's easy, convenient and it works! How long will CHEATmeals™ last me? ... HOW MANY pills? There are 90 capsules in each bottle of CHEATmeals™. Depending on how often you want to "cheat" on your diet or eat the foods you want, a bottle will last about a month. Why would I NEED TO USE CHEATmeals - isn't diet/exercise enough? The truth is, you don't "need" CHEATmeals at all. If you can follow a strict diet most of the time, have no problem holding yourself back at parties, events, holidays, restaurants or any where else where there is a lot of JUNK FOOD and everyone is having fun and "celebrating", then you're fine. BUT, I doubt that's the case or you wouldn't be at this page. Truth is, this is very hard for almost ALL people to do. Simply stated, LIFE gets in the way. Whether it's a stressful, busy life-style or even happy, celebration events. FOOD is always at the core and it's RARELY just vegetables and healthy snacks. So, if you're like most people, you're very busy and/or want to have a social life, then you'll simply take advantage of CHEATmeals with specific "bad" meals. For some, it's mainly on the weekends. For others, could be 2-3x a week due to a hectic work schedule. Either way, YOU'RE in control based on how much food you're going to eat and want to block. No problem, simply send it back for a full refund. Every product we make is backed with a 200% Satisfaction Guarantee. We've been in business since 1996 and online since 1999. Should you have any questions or problems, please contact our support staff. Is it true that CHEATmeals™ lowers cholesterol and blood sugar levels as well? Yes. 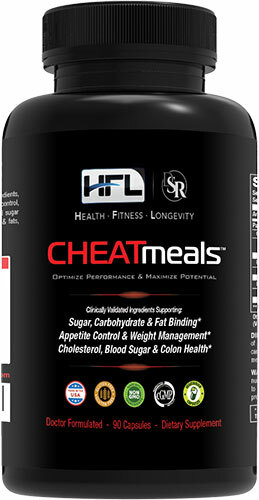 CHEATmeals™ contains special fibers that attach to cholesterol in the blood and help lower your "bad" LDL cholesterol. These fibers also help lower the glycemic index and load of a meal, which helps reduce insulin and keeps your blood sugar stable. With improved blood sugar levels, also comes better triglycerides as well. Is CHEATmeals™ approved by the FDA? The FDA oversees all food and drug products. Since CHEATmeals™ is a natural product, it falls under the scope of the FDA. In 1994, the FDA set up guidelines for dietary supplements, and then created the Dietary Supplement Health Education Act (DSHEA). We follow all of DSHEA's guidelines. In addition, All our products are manufactured under current GMP standards as defined by the FDA to guarantee the highest degree of consistency, reliability, and potency. How is CHEATmeals™ shipped? And do you ship Internationally?